37.11. 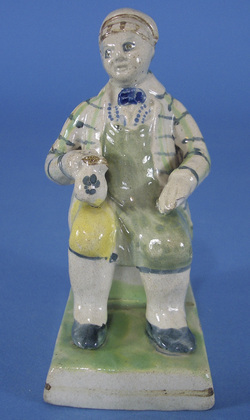 I suspect that there are some underglaze colors as well as enamels on this figure. The colors are suggestive of one of the Scottish east coast potteries. Note the little dog next to the chair. On all the models in volume 2, the dog is beneath the chair. (c) Christie's. 37.12. This is a tiny figure. The height is just 11 cms. Courtesy Mallams. Figures of Tam O'Shanter date from 1828, and as enamel-painting was the standard of decoration by that date, I am not surprised that figures decorated with underglaze colors are very uncommmon. I suspect underglaze colors here, but it is possible that these are poorly fired enamels.Courtesy Nick Burton.